Shopping for a new car can be a stressful process. This statement is especially true for those with large or growing families. That in mind, we're confident recommending pickup trucks as the go-to option for those looking for a transportation solution for the whole family. Family units have unique needs, wants, and desires from other consumers. They require a vehicle that has myriads of different capabilities, plentiful storage space, tons of seating, and more. If this sound familiar, it's likely because you've been wanting the same for your family. Pickup trucks can meet all of these wants and then some. With their unrivaled hauling capacities, larger build, and longevity-minded design parameters, these cars will be great for an economic and effective solution that satisfies all of these needs. You would be hard-pressed to do better than a used pickup truck. First of all, hatchbacks are much more practical than a sedan. The main reason for this would be the fact that hatchbacks almost always have a rear seat that folds over, making it have immensely more cargo space than a regular sedan. Hatchbacks offer some degree of individuality. Many vehicle consumers complain that sedans lack any versatility in their design. This isn’t necessarily true for hatchbacks, however. In many cases, a hatchback will offer a look that is sleeker in design. Another great thing about a hatchback is that it is much more popular than the “station wagon” look of a sedan. For all these reasons, a hatchback could be the right vehicle for you. Hey guys! Long time, no talk. We've been busy on our end trying to improve our business: whether it's our website, our customer service, or the processes we create, our goal is to always improve. When you step foot into our business, we hope you feel a friendly, comfortable atmosphere. Culture is important to us. Deal of Fortune - we've brought back an old favorite, albeit with a twist. 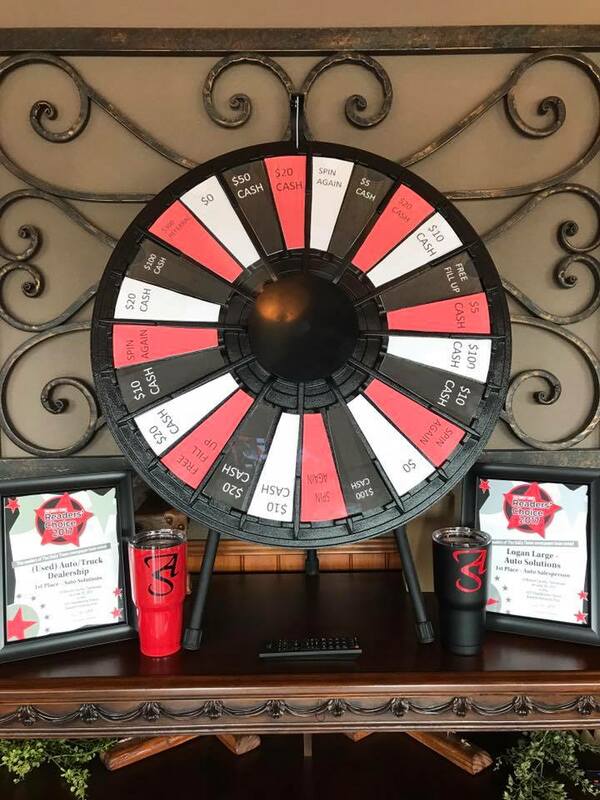 With every purchase, you have an opportunity to spin a wheel and win awesome cash prizes up to $300. Refreshments - we now have a refrigerator in our lobby stocked full of water, Coke, Sprite, Diet Coke, Coke Zero, etc. that is absolutely free to you! Things are exciting here as we roll into our favorite time of year, Fall. From now through December 31st, we are offering major specials on to specific year models: 2004 and 2012. Anyone who purchases ANY 2004 model vehicle by December 31, 2017 will receive a $200 rebate redeemable at the time of purchase. Anyone who buys a 2012 year model during this same timeframe will have their first payment (regardless of price) paid by Auto Solutions. Click our inventory and see if anything 2004 or 2012 tickles your fancy. 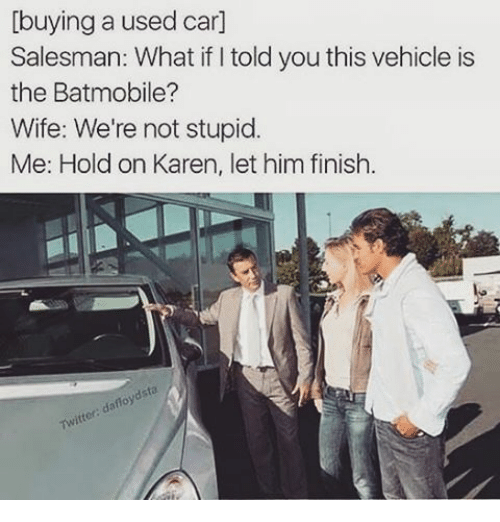 Or just buy any of our other vehicles as well! Car Salesmen typically have a bad reputation. That's why we prefer our staff to have zero experience in this industry prior to hiring. We hire based on communication skill, knowledge, customer service, and integrity. You may not always encounter the smoothest-talker at Auto Solutions, but you will deal with a real person who is happy to speak with you. And most of our staff are pretty funny too. We all got a kick out of this picture, hope you get a laugh out of it yourself!